Books on dance in English are hard to find especially for those young students pursuing dance. " Histrionic Expression ion Kuchipudi Dance" is a book written in simple English language covering all the basic and necessary topics and will definitely be helpful for all the young dance enthusiasts and also preparing themselves for dance examinations. It emphasizes on the syllabi of Government Music & Dance colleges/schools, Degree colleges and universities where Kuchipudi dance courses are offered as a special subject. This book is also useful for those appearing for various scholarship examinations in Kuchipudi Dance and for Under Graduate/Post graduate students as it contains the theory, as well as practical aspects of the syllabus along with few major definitions which are asked during the practical examinations. Dr. P. Rama Devi has taken special care and emphasis on the simplicity and modularity for each topic in the book, thus making it convenient for the readers to memorize the topics of subject in an effective manner. She has also incorporated Sanskrit slokas pertaining to the relevant topics in this book which adds more authenticity. Dr. Smt. P. Rama Devi, is a well known Exponent in the field of Kuchipudi Dance. She established her institution Sri Sai Nataraja Academy of Kuchipudi Dance in 1989 at Secunderabad. She conducts work-shops and lecture-demonstrations in association with CCRT (Centre for Culture & Resource Training) and at various private organizations at different levels in the State. Beyond the Doctorate in Kuchipudi Dance, she holds degrees like B.Sc, B.Ed, Diploma in Domestic Science, Praveena in Hindi and Higher Diploma in Software Engineering. Certificate and diploma course in Kuchipudi dance with distinction and Gold medal in M.A in Kuchipudi dance M.Phill & Ph.D in Kuchipudi Dance. Her outstanding qualification found a place, in the panel of judges for scholarships awarded to the young artists in the field of Kuchipudi dance, by the Govt. of India. And also member in Andhra Pradesh state Nandi TV Films jury. She has penned "Huchipudi Dance in Textual Form" (English), "Kuchipudi Kalapas an Odyssey Rediscovered", (English), "Kuchipudi natyam – Certificate course" & "Kuchipudi Natyam – Diploma Course (With more than sixty definitions) in Telugu and also written few scripts and songs for various ballets and solo items. This is her fifth book that she authored. She has contributed number of articles in News Papers, and the magazines particularly in the Narthanam, Kalaspandana (Bangalore based), natya vedam etc.. She choreographed 24 ballets and more than 50 solo items that won applause. She is a recipient of Senior fellowship award from Central Govt, New Delhi and also received "Kala Subba Rao Smaraka Puraskaram" , "Durgabai Deshmukh", "Lifetime Achievement" "Navarasa Natya Prapurna" & "Panorama of Dance", "Badam Sarjini Devi Award". She has performed all over country, USA and major festivals like Surajkudmela festival, Dussera festival, Deccan festival, 2nd International Budda festival, Amaravathi festival, Sankrit Ballet festival and Soorya festival etc. Art in any for which is a perfect blend of marker's of soul, his penance and his devotion, not only fascinates us fashions our set of thing, moulds our age-old convictions so that a definite destination can be attained. Art can never be out-dated, it always inspires and enlivens, ignoring the man-made barriers which are utterly superficial in nature. India has a great cultural heritage and its preservation is vital for the future progress of the Country. Among the several classical dance forms of Lindia, Kuchipudi which has originated in Andhra Pradesh occupies a pride of place. It represents the essence of Telugu culture in its variety of richness. Considering the invasion of the electronic media, almost all performing arts fear a threat of respectful survival. The situation of forms is much more serious. We shall have to give top priority top this issue and convert this threat into a creative challenge by commanding support exploring creative possibilities of this inevitable media in order to preserve and promote the best in Kuchipudi tradition. With the efforts of Dr. P. Rama Devi this will have to be converted in to a movement. Creating informal platforms for the young and upcoming artistes would be another area which will help and strengthen this movement and mission. Dr. P. Rama Devi with all her efforts established the Sai Nataraja Academy of Kuchipudi Dance and struggle hard to bring the glory and heritage of the Kuchipudi Dance. 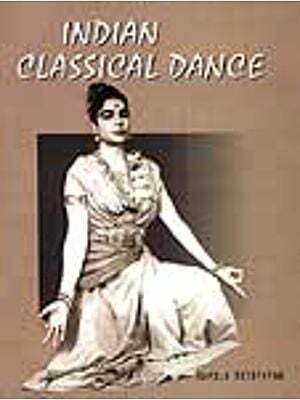 In this book entitled "Histrionic Expression in Kuchipudi Dance" Dr. P. Rama Devi Shown all her efforts and she has proved academically a good researcher by publishing this book. Dr. P. Rama Devi started out with the idea of publishing a text book, but the ultimate response, enthusiasm and end result has been such that she decided to bring it out in the form of an academic text book that will be a collector's item worth cherishing. It fills my heart with great satisfaction that this edition of Dr. P. Rama Devi "Histrionic Expression in Kuchipudi Dance" rendered in English in being published with great efforts and research. Let me take this opportunity of writing some of the salient features of the present edition. IT may be mention I may have the privilege to inform that Dr. P. Ramadevi will soon write another book on the syllabus of P.G. courses also. I have few things to mention here, With India's attainment of independence and of her rightful place in the brotherhood of nations, the world has begun to look at India with new eyes. One consequence of this sudden upsurge of interest has been a glut of books dealing with various aspects of Indian culture – Music, Dance, Costume, Jewellery, Art Crafts etc. "A Series of temple friezes come to life". This is how the dance part of Kuchipudi Dance has often been described, and it is a phrase that neatly sums up the overall character of the art. The present work (Histrionic Expression in Kuchipudi Dance) consists in unreeling the cavalcade of these friezes. The technique of Kuchipudi Dance allows the body of the dance to revel in the glory of its own being, of own form. Responding to the rhythm of the moment the dancer unwinds one vibrant kinetic phrase after another, the entire being backed by a severe regimentation both in practice and in performance. Kuchipudi Dance carries the qualities of both geometry and architecture. The line, the angle, the proportion, symmetry- all play a decisive rule in the building of the edifice. Which is why the style has a chiselled perfection, the rendering refreshing crispness. The imagery that Kuchipudi Dance Conjures up is threaded with a relentless pulse that lives through succession upon succession of meticulously etched dance cameos. A much more significant development in the last haft- a century is that the otherwise regionally popular Kuchipudi dance form gaining popularity and significance globally. IT paved way for dancers from different language back grounds (other than Telugu), learn this art form. The introduction of the training through the Certificate and Diploma courses by the AP Government is indicative of the idea that "it is not only the practical learning but the understanding of the theory behind and the organic relation between the two that is needed for a good practitioner". This introduction also brought in a more focused academic angle to Kuchipudi which subsequently in the Institutions of learing and research, viz., Universities. However, the research works that resulted continued to be barring a few works, thus not reaching out to the wider artistic groups. At this juncture, the present work of Dr. P. Rama Devi gains significance one, being in English reaching non-Telugu and Telugu Kuchipudi learners, and, two, being the first ever book in English that puts together both the Certificate and Diploma course work, practical and theory.